A solution to your knitting errors is here! 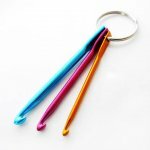 This emergency crochet hook keychain is a quick way to fix many of the oopsie mistakes we all tend to find at the most inconvenient times in our projects - when we are on-the-go and unable to easily fix the issue. With the KnitFix keychain, you'll be able to fix your project without skipping a beat. The keychain features a trio of mini crochet hooks in a wide range of gauges for all sorts of quick fix solutions. They will easily pick up ladders and dropped stitches, help you pick apart knots and twisted stitches, and can even serve as a third needle when working difficult stitches. 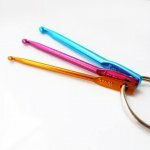 Made out of fine, lightweight aluminum, these crochet hooks are the emergency tool you'll wonder how you lived without. Keep one attached to each project bag or on your keyring so you'll never be without them! The crochet hooks come in three different sizes and will pick-up and hold stitches from laceweight to bulky yarns. 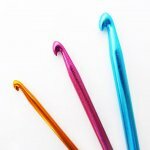 The small gold crochet hook is sized at 3.0mm / 2.5 US, the medium fuchsia hook is size 4.0mm / 6 US, and the large aqua hook is 5.0mm / 8 US. Their mini length (the longest one is just 3 inches) means that you can take them off of the keyring and just store them in your notions case if you want. Each keyring measures 30mm in diameter.